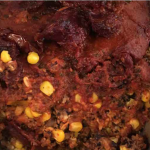 This meatless meatloaf is damn delicious. You won’t even notice you’re missing the meat! The black beans paired in an enticing enchilada bath are just what you need for another Meatless Monday feast. This dish is hearty and filling and a fantastic replacement for protein to fill up the whole family. It’s filled with veggies yet tastes so close to the classic meatloaf recipe, you’ll surprise your kids when you say it’s vegetarian! For even more meatloaf ideas, try our favorite Pinterest Meatloaf recipes or even more tantalizing Meatloaf recipes we’ve set our hearts on! Enchilada sauce adapted from Lexi’s Clean Kitchen, which is by far one of my absolute favorite cookbooks! Mix flaxseed with water and place in fridge while preparing the rest of the ingredients. Saute onion for 2-3 minutes over medium-high heat. Then add garlic, bell pepper, and carrot and cook until onions are translucent. Blend black beans in a food processor and mix into the bowl with sautéed veggies. Add corn, oats, oat flour, and flaxseed and mix until everything is well combined. Heat the oil in a small saucepan over medium heat. Add the tomato sauce and all the spices and salt. Grab a whisk and gently whisk in the chicken broth little by little. In a small bowl or ramekin, make a slurry with the arrowroot flour and water. Add this in and whisk until well combined. Lower the heat and let it simmer for 10 minutes or until the sauce is reduced by a quarter. Dip in a spoon and see that it' think enough to cost the back of the spoon. Remove from heat and let it cool.